April 1, 2008; Monterey, CA; The Monterey Jazz Festival Presented by Verizon, launches its second half-century of legendary live jazz presentation, reflecting the artistic excellence that has made MJF the longest running jazz festival in the world. The world-renowned event takes place September 19-21, 2008 on the familiar oak-studded and beautiful grounds of the Monterey Fairgrounds, the location of the Festival since its inception in 1958. Tickets are on sale now by phone at (925) 275-9255 and on the Monterey Jazz Festival’s website, www.montereyjazzfestival.org. Full Weekend Arena Packages from $220; Daily Grounds Tickets from $35. The Arena/Jimmy Lyons Stage will be one of the hottest sites of the Festival, with a lineup that promises the musical adventure of a lifetime with multiple award winning artists, including vocalists Cassandra Wilson, Jamie Cullum, Ledisi, Kurt Elling, and Nancy Wilson; saxophonists Wayne Shorter, Joshua Redman, and Maceo Parker, the Maria Schneider Orchestra, Christian McBride’s new Quintet, Cuban flautist Orlando “Maraca” Valle, guitarist Derek Trucks and the twelve-time Grammy-winning pianist, Herbie Hancock. Two special tributes will be featured during the weekend, both on the Arena Stage and on the Grounds. On Saturday night, A Tribute to Cannonball Adderley will feature a modern take on the music of the influential and celebrated saxophonist with renowned vocalist Nancy Wilson, trumpeter Terence Blanchard (2007 MJF Artist-In-Residence and Grammy Winner) and legendary saxophonist Tom Scott. Sunday will spotlight John Coltrane’s beloved collaborations with vocalist Johnny Hartman, with Kurt Elling’s Dedicated to You. This special band features Ernie Watts, and the ETHEL String Quartet, backed by the Laurence Hobgood Trio. Friday, September 19 in the Arena will kick off MJF/51 in a Latin style with the MJF debut of Cuban vocalist & flautist Orlando “Maraca” Valle, followed by the angular modernism of the Joshua Redman Trio and the luxurious vocals of Cassandra Wilson, also debuting at MJF. On the Grounds, the popular New Grooves in Dizzy’s Den will reverberate with the electrified Christian McBride Band and Rudder. The Garden Stage will launch in the bebop vein with the George Young Quartet, followed by the talented and youthful Berklee Latin Jazz All-Stars. Matt Wilson’s Arts & Crafts will offer their own take on the jazz tradition to close out the Garden Stage’s musical offerings for Friday night. In the Night Club / Bill Berry Stage, the singer-songwriter Spencer Day will perform original and American songbook favorites, followed by the MJF debut of up-and-coming Israeli saxophonist, Anat Cohen. The Joshua Redman Trio will close out Friday’s Night Club in their second performance of the evening. In the intimate Coffee House Gallery, Yaron Herman will make his MJF debut with three sets of his impassioned take on improvisation, while Quantic and 4onefunk will take the stage in Lyons Lounge with their bass-heavy turntablism. Saturday will give audiences a chance to see Arena artists and the best that jazz has to offer over a broad spectrum of sound. The Garden Stage, a favorite location for the bluesy Saturday crowds, will get off to an exciting start, featuring the newly-minted soul sounds of Ryan Shaw. Fans of vocalist Ledisi will have the chance to see her up close and personal, as will fans of funk master Maceo Parker. The groundbreaking vocal and guitar duo Tuck & Patti will also return to MJF for the first time in twenty-four years, followed by the explosive pianist Rebeca Mauleón & Afro-Kuban Fusion. Saturday’s Night Club / Bill Berry Stage will feature a myriad of styles and artists, both old and new, from the traditional to the experimental. Japanese pianist Junko Moriya will make her MJF debut, followed by the hard-driving big band of the US Air Force, the Falconaires. Tom Scott will present A Tribute to Cannonball Adderley as an instrumental group, and returning master and Grammy-winning trumpeter Terence Blanchard will perform with his Quintet. The Night Club will round out its Saturday schedule with a post-modern musical dialog between two masters, the far-reaching Matt Wilson & Bill Frisell Duo. Saturday’s Dizzy’s Den schedule will also showcase a variety of music and special events that will keep jazz fans captivated. Starting off with a fascinating conversation with vocalist Nancy Wilson, the afternoon will continue with an MJF favorite, the DownBeat Magazine Blindfold Test. The music will commence with the explosive Orlando “Maraca” Valle with his Cuban Lullabies, followed by another fellow Cuban and visionary, drummer Antonio Sanchez & Migration. The Maria Schneider Orchestra will close Saturday night at Dizzy’s Den, performing her Grammy-winning music. The Coffee House Gallery, known for its intimate atmosphere, will also feature a range of musical styles. Saturday’s sets will include La Tuque Bleue performing their Euro-Canadian folk music, the hot musicality of Berklee Latin Jazz All-Stars, and the jagged experimentalism from pianist Marc Cary and his Trio. Sunday, September 21 will cap off the 51st Monterey Jazz Festival with the biggest names in jazz. In the Arena, the day starts off with the winning high school band from the Next Generation Festival, followed by MJF’s youthful Next Generation Jazz Orchestra with Christian McBride. The afternoon show in the Arena will feature the eclectic British superstar, crossover vocalist Jamie Cullum. Sunday evening in the Arena will be a spectacular affair, starting off with Kurt Elling and Dedicated to You, featuring Ernie Watts, the ETHEL String Quartet and the Laurence Hobgood Trio, celebrating John Coltrane and Johnny Hartman. Next, the legendary Wayne Shorter Quartet will perform a masterful deconstruction of the post-bop language that Wayne has pioneered over the last 50 years, and will set the stage for another living legend and multiple Grammy winner, Herbie Hancock, who will close the Sunday night Arena in his 8th performance at MJF since 1964. Dizzy’s Den will again host to the popular jazz panels on Sunday afternoon, with a conversation about Cannonball Adderley, followed by what is sure to be a packed house: a conversation between film icon Clint Eastwood and vocalist Jamie Cullum. The music begins with Christian McBride’s new Quintet and then a reprise of Kurt Elling’s Dedicated to You, singing Hartman/Coltrane to close the evening on a mellow note. High energy can be found in the Night Club, which will be the center of attention for the nation’s best high school bands all Sunday afternoon, followed by the now-classic Hammond B-3 Blowout with Barbara Dennerlein and Brian Auger’s Oblivion Express. Sunday’s Coffee House and West Lawn will also celebrate a different mix of play. First up is the kid-friendly ZunZun, celebrating the diversity of culture through music, followed by sets with the cutting-edge Trio M (with Matt Wilson, Myra Melford and Mark Dresser) in what will be an improviser’s dream. The West Lawn will chime with the Baltic Sounds of the Brass Menazeri. Sunday September 21 is also Family Day, sponsored by Macy’s, returning for the third year. Family Day features activities and fun for fans and families of all ages, including a Percussion Playshop on the West Lawn where kids can have a hands-on experience with percussion instruments, the “Jazzy Jumper” where kids can bounce the day away. With musical entertainment by ZunZun, celebrating the cultures of the Americas, and the country’s seven best high school bands appearing in the nearby Night Club, “Family Day” at MJF has become a favorite activity for young music fans and families. MJF’s Front Box Auction presents another opportunity for jazz fans to enjoy the Monterey Jazz Festival while supporting Jazz Education. From March 31 until June 1, patrons can bid to sit at the front of the Arena with three of their closest friends in four Front Box seats for the 51st Annual MJF. For more information, please visit www.montereyjazzfestival.org. During the Festival, fans are also encouraged to visit the MJF Education Booth in the center of the midway to participate in the MJF Silent Auction featuring unique jazz memorabilia and collector’s items, with all auction proceeds benefiting MJF’s Jazz Education Programs. The Festival’s 10th Annual Golf ‘n’ Jazz Tournament is a rare opportunity to play Pasadera, an outstanding Jack Nicklaus Signature Golf Course. This exclusive event includes a buffet lunch, jazzy gift bag, and golf with cart, plus an evening to remember at elegant Pasadera Country Club following the Tournament. The evening will feature cocktails, hors d’oeuvres, a sumptuous buffet dinner, a jazz concert and live auction, plus the golf awards ceremony. The Tournament takes place on Thursday, September 18, 2008; registration takes place by phone, (831) 373-3366 and online at www.montereyjazzfestival.org. Fans are urged to visit the MJF website for more details about how to participate in this longtime MJF favorite. All proceeds are invested in MJF’s Jazz Education Programs. The 4th Annual Jazz with Steinbeck event will offer fans an exclusive supper club evening in support of MJF’s Jazz Education Programs and the National Steinbeck Center’s Youth Programs. This very special event takes place on Wednesday, September 17, 2008 from 5:30 pm to 10:00 pm at the National Steinbeck Center in Salinas, with jazz entertainment by vocalist Mary Stallings and singer-songwriter Spencer Day, and sumptuous dining created by celebrity Chef Cal Stamenov of Bernardus Lodge, and an array of exceptional wines hand picked by Wine Director, Mark Jensen. This intimate, one-of-a-kind jazz experience promises to have a magical energy all its own. The evening is limited to 140 people. Reservations are available by calling the National Steinbeck Center at (831) 775-4722. Returning partner JetBlue Airways continues to offer our fans low fares, new planes, and free DIRECTV at every comfy leather JetBlue seat. Fans are encouraged to book travel on JetBlue at jetblue.com. Yamaha, a long time partner of both the Festival and MJF’s Jazz Education Programs, will once again be providing Yamaha pianos and drums on MJF/51 stages, and music on the Yamaha Disklavier with on the Courtyard Stage. North Coast Brewing Company returns as Official Beer for MJF/51, with a variety of North Coast brews available all around the grounds of the Monterey Jazz Festival, led by their lauded Brother Thelonious Belgian-style abbey ale. Apple/iTunes will be providing free music samplers to all MJF/51 attendees, featuring a collection of Monterey Jazz Festival artists. Returning Bay Area Media Partners, the San Jose Mercury News and KKSF, as well as JazzTimes and DownBeat Magazines, will be helping MJF get the word out about the Festival and its Jazz Education Programs. Macy’s returns as sponsors of Family Day at Monterey, hosting special entertainment and activities for younger jazz fans and fun for the whole family on Sunday, September 21, 2008. Tickets are now on sale on the Monterey Jazz Festival’s website, www.montereyjazzfestival.org or by phone at (925) 275-9255. Sunday, 9/21: Dedicated To You: Kurt Elling Sings Coltrane/Hartman featuring Ernie Watts, ETHEL String Quartet & Laurence Hobgood Trio; Christian McBride new Quintet; Hammond B3 Blowout with Brian Auger’s Oblivion Express & Barbara Dennerlein Trio; Kyle Eastwood; Trio M with Myra Melford, Mark Dresser & Matt Wilson; Jamie Davis, Brian Blade Fellowship, Quantic, 4onefunk, La Tuque Bleue, Brass Menažeri; Family Day with ZunZun, the country’s best high school and college ensembles, DownBeat Blindfold Test, and more! 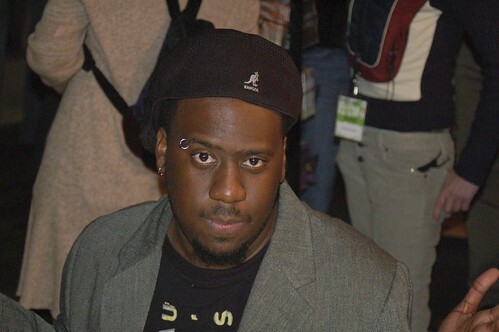 Photo of pianist Robert Glasper at the 2006 Monterey Jazz Festival by James Knox. All rights reserved. This entry was posted on Saturday, June 28th, 2008 at 12:29 pm. It is filed under Monterey Jazz Festival, Music News/Info. You can follow any responses to this entry through the RSS 2.0 feed. Can you work on your friends at Yoshi’s to try and get Nancy Wilson before or after Monterey. I can’t tell my bff that I’m skipping her wedding to see Nancy Wilson at Monterey Jazzz. She just wouldn’t understand.